On the southern slope of Mount Adams in Washington, Moffett and her students are working to learn how soils recover moisture following wildfires so that trees and plants can sprout again. The field area has suffered three fires in the last 14 years — the McDonald Ridge fire of 2004, the Cold Springs fire of 2008 and the Cougar Creek burn of 2015. The research is supported by a National Science Foundation grant Moffett shares with Andrés Holz of Portland State University. They are studying “short‑interval reburns” to better understand the effects of repeated wildfires on Cascades forest ecology and hydrology. Over the next few years, Moffett, Holz and their student research teams will examine whether an altered hydrological cycle and changes in soil moisture may change how plants regrow after a fire and also make them more vulnerable under some conditions to repeated fires in the future. They will also help identify whether, and over what time scales, reburns might mitigate or worsen the downstream flood risks that often follow fires. Ecohydrology encompasses Moffett’s global interests in water as a critical sustaining resource for humans and ecosystems. Her research ranges from forest rejuvenation after wildfires, to the effects of heat and water balances on urban life, to the ability of rivers to cleanse themselves of some pollutants before their waters reach the sea. Moffett has the uncommon distinction of concurrently leading three separate NSF grants to study these three phenomena. In the spring of 2018, she received NSF’s prestigious Faculty Early Career Development Program (CAREER) award. These competitive awards provide five years of support for pretenure teacher‑scholars. Moffett will receive about $690,000 to study how the urban water cycle interacts with the heat generated by urban areas. “One of my great interests is how water plays a key role on our planet, including the basic landscape changes it can make, how it can help support ecosystems, and of course how water is important to people,” Moffett said. These interests led her to think about how ecohydrology research today often overlooks the majority of people on the planet — those who live in cities. Currently, most environmental science research takes place in rural areas that are still considered “natural.” In cities, by contrast, humans have reconfigured the landscape into alternating patterns of pavement and vegetation, with undeniable implications for the movement of water — into storm drains and waterways, but also into the soils and atmosphere. Through the CAREER grant support, Moffett is exploring how lessons from natural science conducted in rural natural areas might apply to urban environments, and whether better understanding urban heat and water balances could have applications for making cities more livable despite accelerating global change. For example, she is working with Vivek Shondas of Portland State University and research associate Yasuyo Makido on a spatial analysis of relationships between the patterns of urban land cover and the patterns of urban heat. The objective is to better understand how urban planning relates to residents’ comfort. The research, which has been analyzing heat and water in a set of 12 residential streets in Portland, has sparked a broad and deep collaboration between Moffett, WSU’s Director of Metropolitan Extension Brad Gaoloch, and more than 100 other extension staff, researchers and municipal managers across Washington and Oregon. The final phase is developing both a physics‑based model of stormwater and heat, and also a simplified decision‑support model that city managers can use to assess individual streets. Moffett received her first NSF grant for the study of the parts of rivers that are near the river mouth and influenced by tides but still freshwater. In these zones, rivers might slow and so enable more nutrients to be naturally removed by the river ecosystem before the nutrients harm the coast. 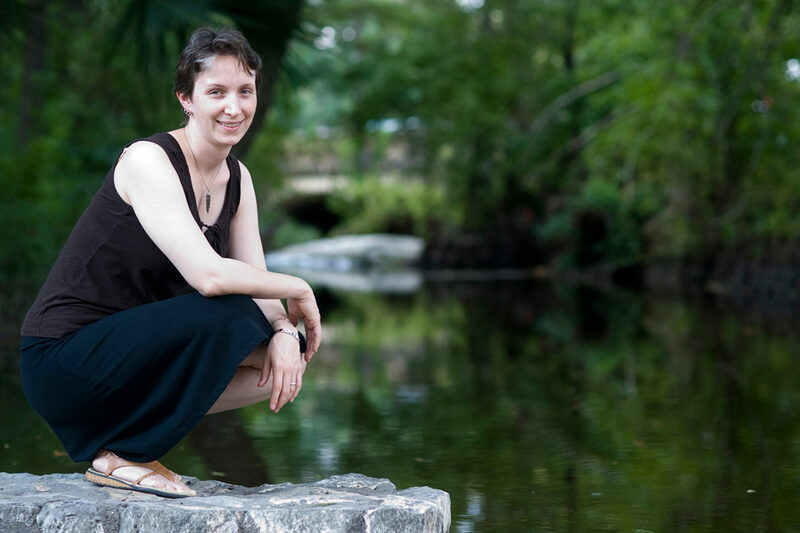 Moffett and her student Allan Jones have established a definition for these “riverine tidal freshwater zones,” the competing influences of tides and river flow on its dynamics, and its changes in character along the length of the river. Jones and Moffett are completing the project with a computer model analysis to determine under what conditions worldwide these riverine tidal freshwater zones may exist. Moffett’s collaborators at the University of Texas at Austin are quantifying these zones’ effects on nitrogen pollution and carbon in river waters that flow into sensitive coastal bays. All of Moffett’s studies have an educational component. As part of the CAREER award, she plans to design outdoor laboratory science modules to help students (preschoolers and WSU undergraduates) appreciate that they can learn about the environment wherever they are, even in an urban setting. She is particularly interested in making environmental science studies accessible to more students, including those with various mobility needs. She is guided by the vision that everyone can learn to feel a sense of place, understanding and belonging in their home environment, and perhaps in environmental science studies. Her research on fires will include coordination with forest and water managers designed to help improve management practices, and may also include a museum educational display. Her research on coastal rivers has included colleagues’ collaboration with a National Estuarine Research Reserve to design and implement public educational kayak outings on the study rivers. This article originally appeared in fall 2018 issue of Northwest Crimson & Gray, the magazine of WSU Vancouver.